I was delighted to find the long-missed spider at my favourite park last Sunday. 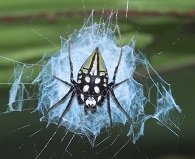 The Pied Orb-weaving Spider (Neogea nocticolor) is a rainforest spider that is considered to be quite rare . The last time that I saw one at the same park was 8 years back in February 2011. 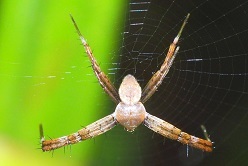 Other sightings of this spider in Singapore that I had gathered from the Internet included one specimen from Nicky Bay in December 2010 found in the same park. It might be the same spider that I saw in early 2011. 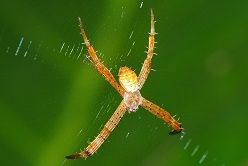 A more recent sighting was from a YouTube post upload in July 2018 with the video of the spider taken at Dairy Farm area. I had come across the spider by chance when I was examining a piece of brown object on the surface of a large leaf from the Simpoh Air (Dillenia suffruticosa) to determine whether it was a forest cockroach (Pseudophoraspis nebulosa) or just a small piece of dead leaf. 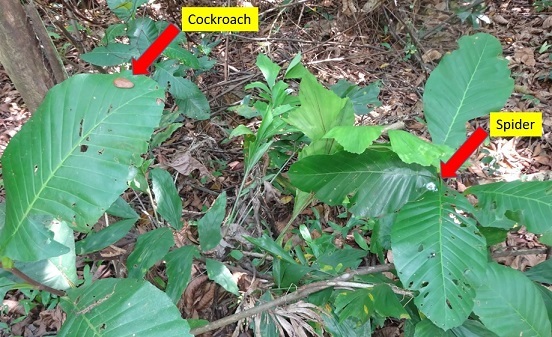 The web of the spider was just by the side of the cockroach (as illustrated in the picture). The spider is relatively small and may not be easily detected if I had not stopped by to examine the cockroach. With my macro camera lens with me, I was able to obtain a set of much better pictures of the spider this time round versus those taken back in 2011. When I returned this weekend to the same location, the spider was no longer around. Besides the rare Pied Orb-weaving Spider, I had come across 9 other spiders during the 2.5 hours walk. 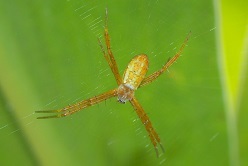 Three Argiope spiders were seen at separate locationsthat included a male spider (light brown form) and 2 juvenile spiders. The remaining 6 spiders sighted were 3 jumping spiders (Family: Salticidae) that included a male Viciria praemandibularis, 2 ant-mimicking jumping spiders and an unknown tiny jumping spider; a Lynx spider (Family: Oxyopidae) and an orb-weaving spider (Family: Araneidae), Gasteracantha kuhlii. I will share some other minibeasts sightings from this trip in a subsequent post.